The early days of archery season are perhaps the best time of the year to pattern and shoot a buck. Here are the three best places to waylay an early-season whitetail buck. Opening weekend of archery season in many states opens at a time of change for the whitetail buck. Most seasons open in September or on October 1. In early September, the velvet comes off the antlers and the testosterone is beginning to rise. The bachelor groups are breaking up and the food sources are changing. Some hunters love this time of the year because the deer are almost totally focused on the available food and are unmolested so their patterns are somewhat predictable. Others scorn this time of the year because the food sources can change rapidly and the bucks will move with the food. The key to success during the early season is keeping on top of the food preferences and moving as the deer move. There are patterns available, and if you are diligent, you can get yourself in the right place at the right time. Here are three high-percentage stand sites for the early days of the bow season. Across the whitetail’s range, hunters are out in the late summer glassing fields, trying to get a glimpse of the buck they may be able to harvest come fall. This is an effective way to get a feel for the deer that live in an area, and helps us learn where they are feeding, but it only goes so far. Many times the mature bucks will not enter a field in a position they can be seen from a distance. They may use a ditch, grassy waterway, or finger of trees to enter a field and avoid stepping fully into the open until the last moments of daylight. Additionally, it’s common for the deer to change trails or entry points. Rather than pick one and hope for the best, it’s often better to place a stand in an area with high visibility of the entire field. A high corner, for example, would allow you to spend an evening on stand in an area that might offer a shot, but has a better chance of giving you a view of the most common entry points for the feeding deer. I call these observation stands because they allow you to observe the activity from a distance, then make a more surgical, precise move once you know where and when your target buck is likely to appear. Bucks like to hang back and observe behavior in the field before entering. They will let the does and younger bucks move out into the field and feed. They will hang back and watch the body language of the deer in the field before they enter. They choose staging areas where they can see the field at times, but primarily, they just hang out and wait to see if the deer already in the open are feeding calmly. These areas can be identified by the sign the bucks leave while loitering. Droppings, tracks, rubs and sometimes scrapes are signs of their presence. These areas are one of the best places to shoot a big buck in the early season because they spend a considerable amount of time here during the last hour of daylight. Place your treestand where you can take advantage of the wind and do not hunt the stand until the wind is right. You may only get one chance to shoot a big buck in one of these areas, so make sure everything is right before you make your move. 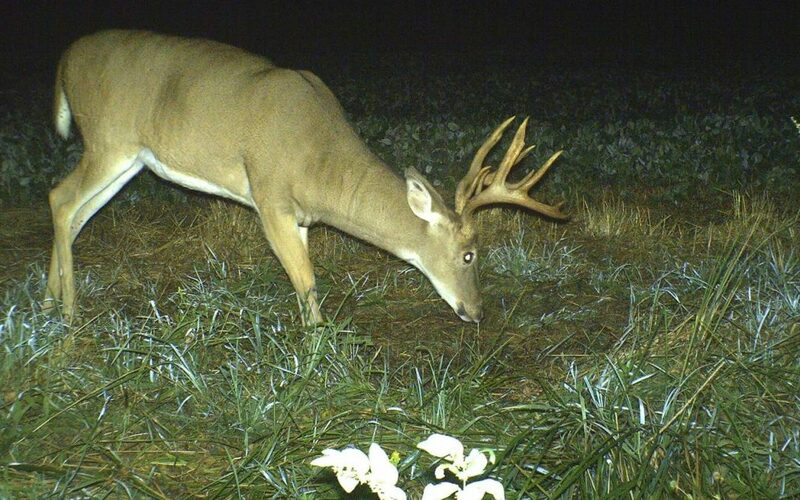 Trails that follow the edge of a crop field can be hard to find because they do not get much use, but they can be just the ticket for an early season buck. Like the two sites already mentioned, these are the results of the mature bucks’ reluctance to enter the open during broad daylight. Parallel trails will be from 20 feet to 30 yards inside the edge of the field and are indistinct trails so they are usually identified by a few tracks rather than the bare earth of a well-worn path. Bucks use these trails to scent-check the field and to connect observation spots or staging areas. A buck may show up at the edge of the field an hour before he is ready to enter. These trails seem to give him something to do while he waits. Walking these trails gives him a sense of security and helps him determine if the “coast is clear” so to speak. Most times these trails will be on the downwind side of the field, and since the deer tend to enter the field from the downwind side, they may cross an entry path. Where a parallel trail crosses and entry path is a good spot to set up a treestand on the downwind side. You may be back in the timber too far to have a clear view of the field yourself, but that’s a fair tradeoff for an increased chance of shooting a mature buck. 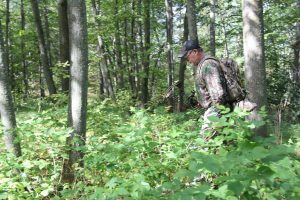 In all cases, no matter which one of these three stand sites you choose for the early days of the season, enter and exit the stand site carefully and use the wind to your advantage. The deer learn fast that they are being hunted so wait until everything is right and then move in to get the job done.